Life at Arch Angels headquarters has been heating up, and we're building our own little fan club. We had two trade shows to attend last month, and our in-house designers put together these banners for our booth. I personally think they're better than the professional one we paid for! 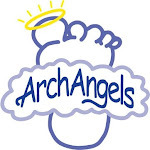 We'd love to see your drawings of your Arch Angels or pictures of your little angels. Send them to us here, or at info@myarchangels.com. More to come!